The crowded train carriages at Clifton Hill station are a sure indication that something momentous is about to occur. There’s still a couple of hours to go before the opening bounce of the Richmond-Collingwood preliminary final. The whole town is abuzz at the prospect of the stoush between the inner-city rivals for a place in the 2018 decider. My son and I are confident. No premiership hangover for the Tigers. There might be a few imitators, but nobody turns on the intensity and fanatical pressure like we do. A Collingwood supporter pressed against us in the congestion confides to his girlfriend, “If we’re gonna go down we’ll go down fighting.” Clearly, they know it too. Eddie McGuire’s declaration of “tiger hunting” is pure fantasy. The moment arrives. A pause between the time players line up and the commencement of the national anthem raises the tension to code red level. Both armies attempt to rouse their fighters onto victory. The Collingwood section next to us starts the dirge-like Coll-ing-wood chant. It leads to a vociferous response from the Tiger fans in our area. The Tigers control proceedings for the first ten minutes or so. But when De Goey goals at the 27-minute mark to put the Magpies up by 23 points there is cause for alarm. Matters are not proceeding as we anticipated. Richmond’s playmakers fail to impose their authority on the match. Astbury and Vlaustin reveal the pressure they are under when they kick out on the full late in the quarter. My son leaves his seat and dashes down the steps into the depths of the Southern Stand to compose himself before re-appearing a few minutes later. In the week leading up to the game we had expressed our hope that Collingwood would select Mason Cox in their team. After substandard performances in the Woods’ first two finals we regard him as a liability that the clinical Richmond defenders can exploit. But like prospectors hanging onto an investment in a struggling Texas oil well against all advice to the contrary, the Magpies had stuck by him and were suddenly striking black gold. In the space of 10 minutes in the second term Cox gathers three towering marks and boots three majors to send the Magpie barrackers into a frenzy. They start up a USA chant that makes me squirm. Leave that one to the Americans themselves. Why is Astbury unable to stop him? It isn’t until after the match that we find out that he had turned up to training on the previous day with flu-like symptoms. The key defender had been quarantined from the rest of the playing group and placed on a drip in hospital. In his weakened state he was incapable of preventing Cox from lumbering in and leaping at the ball. After he slotted his third the difference had ballooned to 42 points and the Tigers were being chased from the arena by a savage flock of nesting black and white birds. Dustin Martin had been the subject of relentless media scrutiny throughout the week with rumours of a knee injury. The club finally admitted that he had suffered a corky against Hawthorn in the qualifying final which had subsequently bled into his knee. Now he is unable to burst out of the packs, fend off assailants or accelerate away from pursuers. He is effectively guarded by Greenwood on the ball and by Howe when he ventures forward. It appears that Richmond’s good fortune at having virtually all of its list available for selection has evaporated. You can manage recovery and rehabilitation as diligently as you can, but sometimes things happen that are beyond your control. 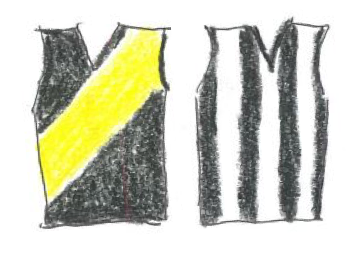 We had scoffed at Collingwood’s attempts to imitate Richmond’s blueprint for success. Now they subject the Tigers to a dose of their own medicine. They apply suffocating pressure to the Richmond ball carriers, outnumber their opponents at contests and move the ball with relentless intent through the central corridor. Hardwick and his lieutenants make decisions which backfire on them. Rance is left to his own devices against the whippet-like pace of De Goey and struggles to counter him. He isn’t moved until early in the third after he has a fourth goal scored on him. Grimes takes over and quells De Goey’s influence. But it’s too late. The decision not to tag Sidebottom in the first half is a fatal error. He accumulates possessions at will, farms the ball out to teammates and wanders around the midfield with the poise and casualness of a nineteenth century squatter surveying his land. Grundy begins to dominate Nankervis. Big Nank exits for a breather and Grigg assumes his back-up ruck duties. Grundy skilfully exploits the situation by belting the ball 10 metres from the ruck contests, opening up play and neutralising Richmond’s hunter gatherers around the ball. Adams and Pendlebury provide ample support for Sidebottom. Richmond’s masters of the home and away season go missing at the worst possible time. When De Goey boots his third at the 23-minutes mark of the second term to take Collingwood’s lead out to 52 points I ruefully concede that the Tigers’ season is over. The Woods have scored the last eight goals of the game, it’s a ten goal to two first half and the deadly ambush is complete. The run of 22 consecutive wins for Richmond at the MCG is about to come to a deflating and inglorious end. Riewoldt, playing a lone hand in attack, boots three in the third term. After Jack bags his fifth at the start of the last quarter and Higgins follows up with another at the seven-minute mark, the Tigers are within 21 points. It’s an illusion. Snapshots from Treloar and Grundy put paid to any faint hopes of a miracle comeback. The victorious tribe proclaim their conquest. The Coll-ing-wood drone is renewed. Good Old Collingwood Forever. Richmond turnovers are cheered. They bid lusty farewells to despondent Tiger barrackers heading for the exits. I pointedly ignore the taunts and endure them with as much dignity as I can muster. The siren sounds and my son and I immediately commence our evacuation. I shake the hand of an emotional Collingwood supporter as I climb the steps. It helps me process the loss. “Thank you,” he says. Outside the stadium thousands of subdued fans in yellow and black are making their way to the stations. The Collingwood supporters haven’t left the stadium and their celebrations reverberate around the night air. The stars aligned tonight. Malevolent stars for the Punt Road push. Collingwood were brilliant and played what must surely be their best game under the authority of Nathan Buckley. The Tigers played their worst game for the season on an occasion when it really mattered. Such are the fortunes of football. The injustice of it all. The season’s best team will not be gracing the stage on Grand Final Day. It’s not the first time this has happened and it won’t be the last. The Richmond barrackers ride in silence on the train as they head home to their families in the northern suburbs. Our plans for the coming week are in tatters. No final training session at Tigerland on the Thursday night, no Grand Final parade on the Friday, with a visit to the Australian Cartoon Gallery and Museum at Southbank to view their exhibition of footy caricatures. My boy and I would have been there next Saturday, having arranged to purchase premium tickets from a contact who was generous enough to sell them to us at cost price. No raucous celebrations in Swan Street on the Saturday night and no ecstatic welcome to heroes wearing dark shades on the Sunday morning at Punt Road. Not this year. I’m reminded of the suffering of Job in the Old Testament book that bears his name. Job was a good man who lost his family, his wealth, health and reputation through no fault of his own. His wife urged him to blame God for his misfortunes and die. It’s like that with the Tigers. We rejoiced in the glorious triumph of 2017. The wonder of it will never leave me. And now we crash out in a preliminary final after topping the ladder and being installed as premiership favourites. Joy and pain. You can’t have joy without experiencing pain at some point. Any club that plays finals faces the possibility of being outplayed in a particular encounter and suffering elimination. You have to feel for the players, who will surely take a while to deal with the crushing disappointment of what transpired tonight. Job’s fortunes were eventually restored and he prospered even more in the latter stage of his life. My son and I console each other. Tom Lynch is making his way home to Victoria to work with Jack in attack. We can do with a versatile, mobile ruckman to act in tandem with Nankervis in the ruck. A few refinements to the game plan, some astute trading and drafting and we’ll give it another shot. The wisdom of Job! I think that’s an excellent philosophical response to this particular event. The other thing, from my point of view, is that the forthcoming Collingwood vs Wet Toast GF interests me not at all. I hope they both lose, even though I concede this is unlikely. But at least it frees me up to do a whole lot of other stuff this week when I would otherwise have spent half my time thinking about football.